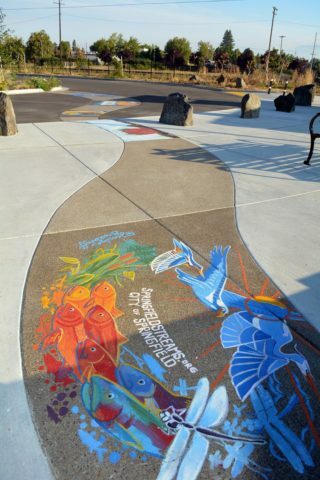 Artists in the Eugene-Springfield area are invited to submit unique mural designs for UpStream Art. 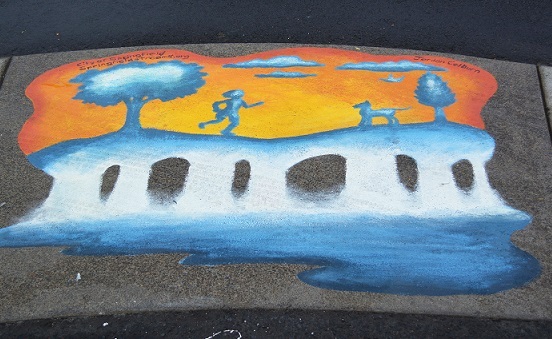 Murals will be painted on the ground at the Booth-Kelly trailhead of the Mill Race path near downtown Springfield. 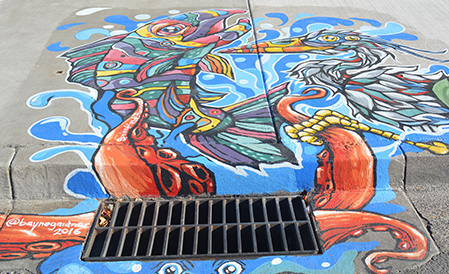 The murals will convey a visual message about everyone’s role in helping to protect our waterways. 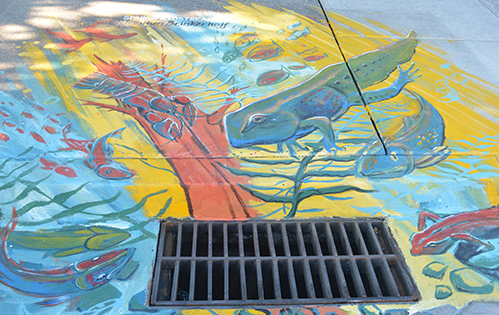 Artists have until 5 p.m., Friday, May 24 to submit an application and design. 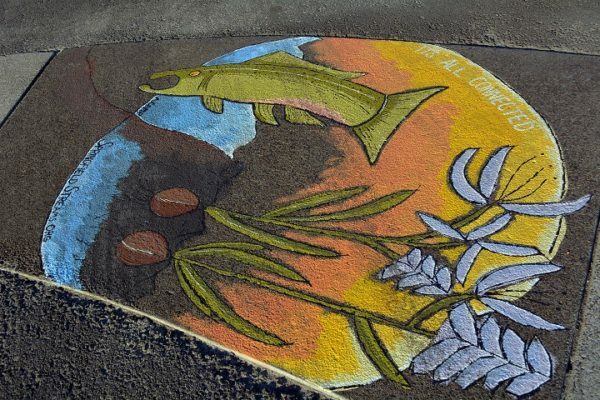 Artists are encouraged to create designs that speak to this year’s theme: “It’s All Connected.” The murals will ‘flow’ from one to another toward a vegetated stormwater treatment area at the trailhead. 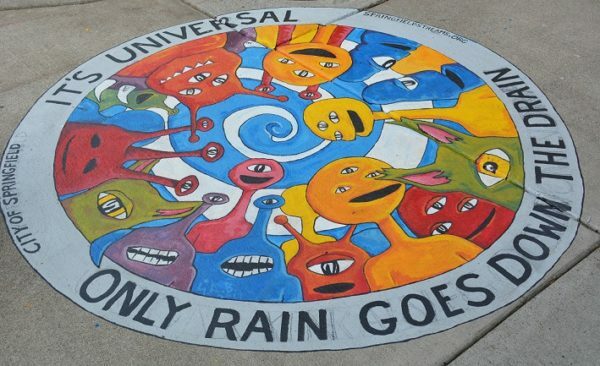 Selected artists will be compensated for their completed artwork, and they will paint the murals on August 23 and 24, 2019. Read the Frequently Asked Questions for more information. 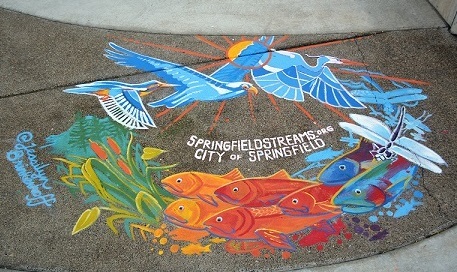 If you have questions, please contact Mary Healy at 541.726.3626 or WaterResources@springfield-or.gov. Submit the Application Packet and your design by 5 p.m. on Friday, May 24, 2019. 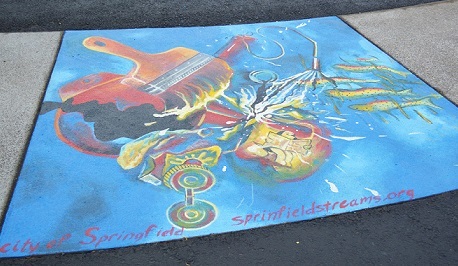 Since 2016, the UpStream Art project has brought to life 16 unique murals on storm drains in downtown Springfield. 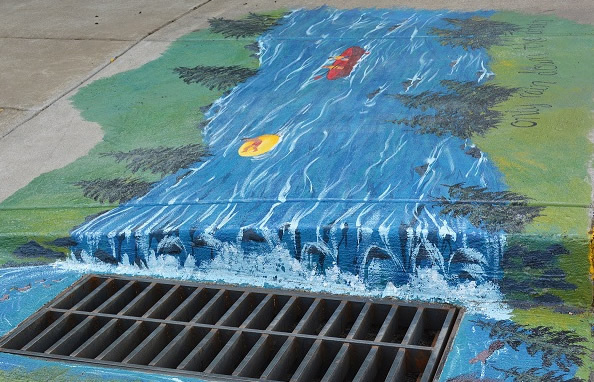 Click for a map of storm drain mural locations. 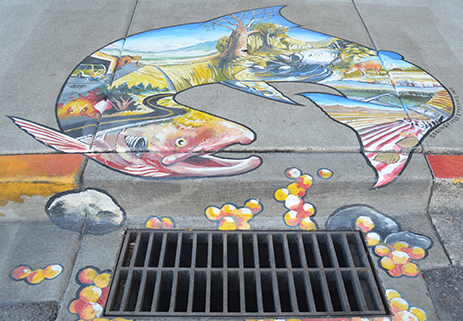 The murals raise awareness of the importance of storm drains and their connection to our rivers. 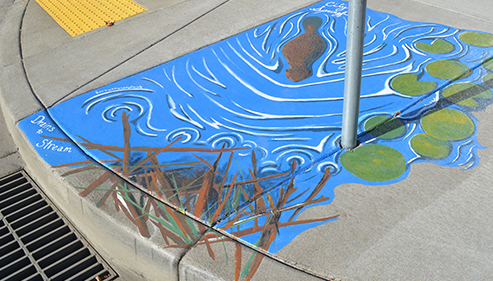 Pollutants such as oil, trash, and pet waste are harmful to water quality and aquatic life. 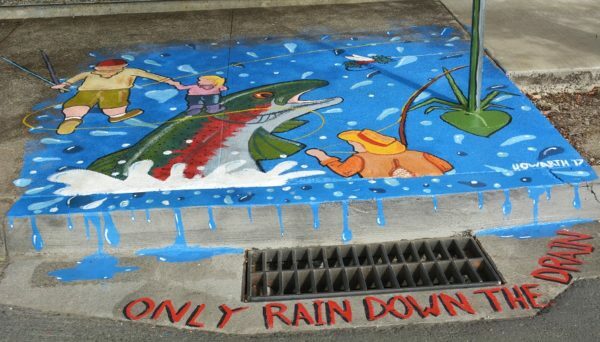 Everyone can protect local waterways through simple, everyday actions. 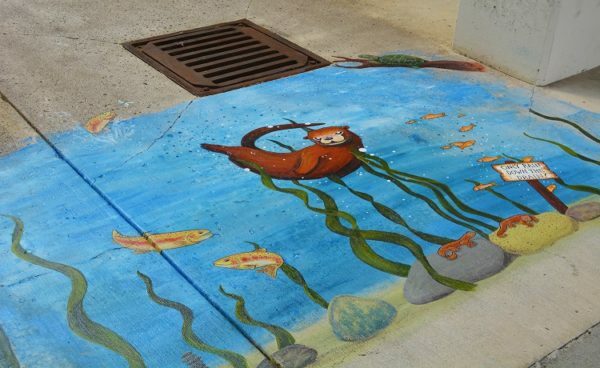 Interested in holding a storm drain mural project in your community? Read our frequently asked questions. As our community grows, ground often gets covered up with asphalt, concrete and buildings. Without realizing it, we are disrupting an important part of the water cycle. 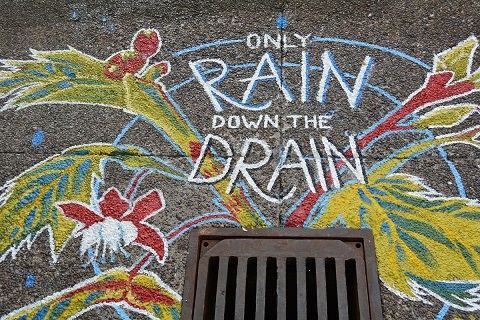 Instead of rain naturally filtering into the ground, in urban areas it flows over roofs, driveways and streets as stormwater. 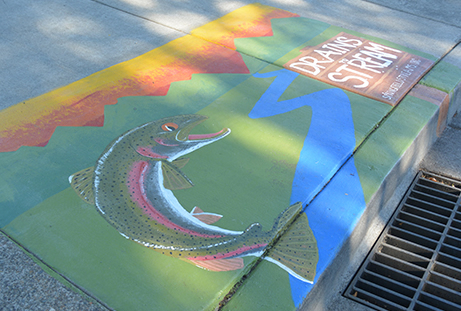 Stormwater can pick up pollutants and transport them to our local waterways via the storm drain system. Pollutants include everyday items like pesticides or fertilizers in our yards, oil in our cars, and even soap. 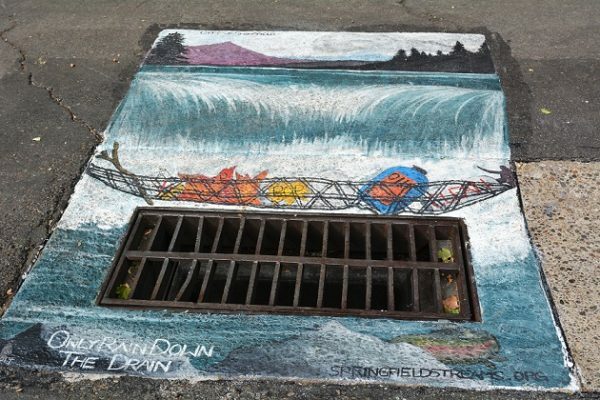 When introduced into the waterway, pollutants have a harmful affect on aquatic life and the health of our rivers. Outfall in Island Park where UpStream Art storm drains lead to. 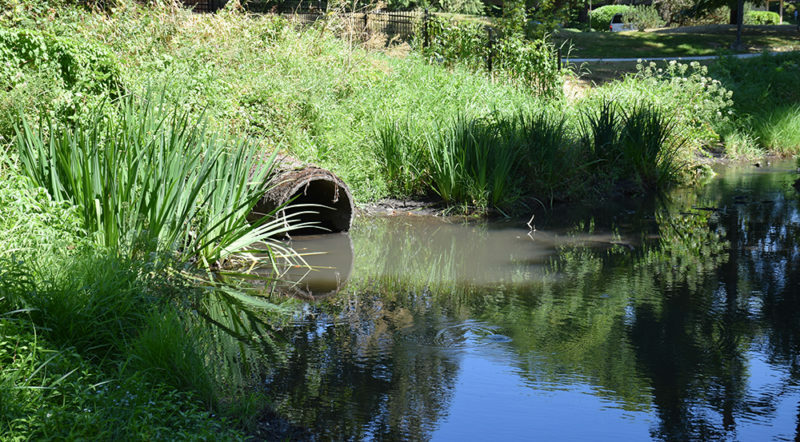 To learn more about how you can help prevent water pollution, read this Prevent Stormwater Pollution resource and check out our Clean Water at A Glance factsheets.